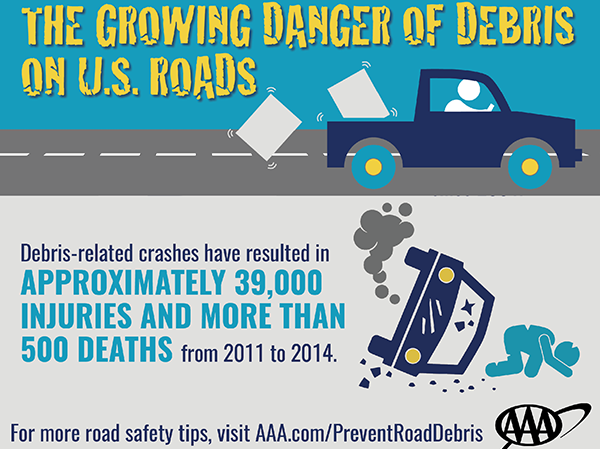 The AAA Foundation for Traffic Safety estimates that nationally over 51,000 car crashes are caused by debris on the road every year and about two-thirds of debris-related crashes are the result of unsecured loads and improper vehicle or trailer maintenance. Drivers have a much bigger responsibility when it comes to preventing debris on the roads than most realize – both outside the car for the protection of other drivers but also inside the car for the protection of themselves and their passengers. Whether you’re packing the car for a Fourth of July road trip or bringing home a haul from a local yard sale, securing your load before hitting the road is of the utmost importance. Tie down load with rope, netting or straps. Layer your load: put lighter items at the bottom and heavier items on top to help keep them in place, then secure the heavy top items. Don’t overload your vehicle (take multiple trips when necessary). Always double-check your load for secureness. For motorists in a vehicle behind one with a heavy load, do not tailgate or drive too closely behind them. Give your vehicle space to come to a complete stop or safely change lanes in the event that debris falls from the car in front. In North Carolina, drivers face a $100 fine for creating road debris and South Carolinians will be charged with a misdemeanor along with a $100 fine. A full list of U.S. state road debris laws can be found here. Securing the items inside your vehicle is equally important for the safety of the driver and the passengers. Loose items can cause major damage in the event of a crash. Watch the video below for an example.